If you don’t see a certification up on your mechanic’s wall that’s from ASE (Automotive Service Excellence) or from AAA, you’re likely dealing with trouble. Any of these reputable certifications will assure you that the mechanic knows what they’re doing. A reputable one will proudly display these certifications somewhere so every customer can see them. If they don’t have them visible, it doesn’t necessarily mean the mechanic isn’t certified, just ask them to prove it to you. If a new mechanic just opened shop and you’re not familiar with their background, don’t be afraid to ask them questions. Ask them about where they came from, and their education. Also, ask them about the repair equipment they use in the shop. If they refuse to answer any of these, they may be hiding something and it may be best to take your car to another shop that’s been around for a while. A common sign of a shady mechanic is when they refuse to give you a written contract on how much the repair will be. Never give the go-ahead to do something until you know exactly what’s wrong and how much it’s going to cost you. Mechanics using a blank contract can end up charging you whatever they want. They also should offer warranties on the parts they install. Otherwise, unbeknownst to you, those parts may be used and go out within days or weeks. While certain quickie lube companies are known for forcing people to have coolant, steering, and transmission flushes, sometimes they aren’t even necessary. If your mechanic insists you get a flush not long after you’ve had one done, you’ll know there’s an issue. It’s the oldest trick in the book. It could be the mechanic showed you metal shavings from your transmission in an attempt to make you think a new transmission is in order, or any other scam, but when a mechanic says extra repairs are necessary, think twice. 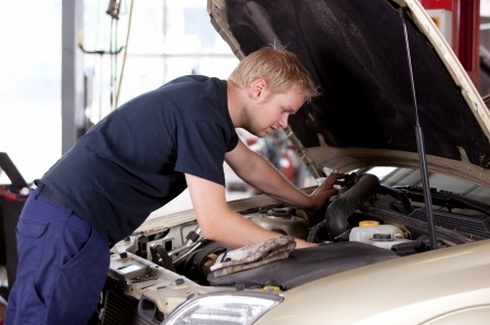 Your best bet is to consult the MetroMile app for notification of any engine trouble codes and to search the Web yourself on what the true signs are when they say that something needs repair. Shady mechanics prey on the naive and uniformed, and armed with our app and the mighty Interwebs, you can show that mechanic that you know what’s up!